New ILO Member Serving Bancroft Coming Soon! Bancroft OPP (Ontario Provincial Police) assert that distracted driving has replaced driving while impaired by drugs or alcohol as the number one killer on Bancroft area highways. Specifically, distracted driving has surpassed impaired driving as the number one cause of traffic fatalities in the region. Police estimate that approximately 25% of all fatal Bancroft area crashes in 2015 will be the result of distracted driving and that most fatal accidents will involve men. In some instances, it will be the distracted driver and/or passengers who are killed and in others, a distracted driver may strike and kill pedestrians attempting to cross at an intersection or while walking on a sidewalk. With the proliferation of smart phone usage, several distinct demographics of people can be identified as the most frequent offenders of distracted driving laws. Teenagers, in particular, use instant messaging and social media constantly as it has become the preferred method of communication and social interaction. Young adults aged 20-30 use their smart phone instant messaging programs to communicate with friends and family throughout the day. Business professionals, particularly those in sales positions, feel the need to stay in constant contact with their company and prospective customers. For business people, driving time is "down time" and some of us are unable to resist the temptation to make the most productive use of this time by continuing text message conversations while travelling to and from appointments. In other words, many drivers between 18 and 50 are involved in distracted driving at some time or another. The web site http://distracteddriving.caa.ca/education/ has quoted a number of interesting statistics from authoritative sources like the Virginia Tech Transportation Institute, National Highway Traffic Safety Administration, and the Alberta Department of Transportation in order to make a case for the magnitude of the distracted driving epidemic. It is estimated that distracted drivers are about 25 times more likely to be involved in a fatal or near-fatal motor vehicle accident than non-distracted drivers. Most (84%) of those fatalities were due to carelessness attributed to being distracted by an electronic device. In fact, some 80% of all crashes, fatal or otherwise can be attributed to general driver inattentiveness in one form or another. As a result, distracted drivers are three times more likely to be involved in a motor vehicle accident than drivers who pay careful attention to their driving. Over 4 million motor vehicle accidents per year can be attributed to distracted driving in all of North America. And it's not only texting, the internet and cell phone calls that are to blame. Drivers are 8 times more likely to be distracted while their children, especially infants, are in the car with them. According to the Canadian Government, it is estimated that distracted driving increases Canada health care expenses by as much as $10 billion dollars annually. Ontario legislators are aware of the seriousness of this problem and are attempting to reduce distracted driving fatalities by increasing the punishment for those convicted of the crime. As of June 2015, there have been a number of important changes made to the Making Ontario's Roads Safer Act and also amendments to the Highway Traffic Act, Provincial Offenses Act and Highway 407 East Act in order to deal with the continued problems of distracted driving and other problematic driving habits. In an effort to deter Ontario drivers from distracted driving, the minimum fine for a distracted driving conviction has been increased five-fold, from $60 up to $300; the maximum fine has doubled from $500 to $1,000. In addition, offenders will now be assigned 3 demerit points on their license if convicted. One encouraging aspect of the distracted driving epidemic is that smart phone usage can be avoided if drivers simply change their mindset. To ensure full attention as drivers, we need to pull over and park our vehicles before using our cell phones. In the future, we may see motor vehicle manufacturers required to install technology that disables the use of a cell phone while a vehicle is in motion. 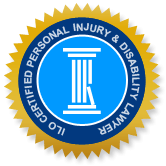 The Bancroft Personal Injury Lawyers of Ontario (ILO) law firm is experienced in all aspects of advancing law suits against the negligent parties and their insurance companies in distracted driving cases. If you or a loved one has been injured or killed due to the negligence of a distracted driver, please give us a call for a no-cost, no-obligation consultation. Our lawyers stand ready to assist you in every aspect of your case.